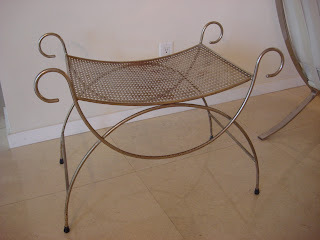 My sister and I went to a couple of garage sales on Saturday on the way to West Elm. Although on Spring Break last week, I really didn't make it out to the thrift stores. I spent a lot of time cleaning out closets in my house and figured, if I'm trying to simplify my life, I don't need any more junk. I couldn't pass up this stool for $2.00 at a garage sale. I know, I know, another stool/bench. I realize that it's a little weird, but it's so not intentional, I promise. I have to figure out what I'm going to do with this one. 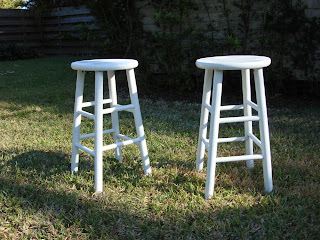 So just to add to the stool mania in my house, I found these in my laundry room. Does that count as a "found object"? When I show you pictures of my laundry room, you will understand my question. 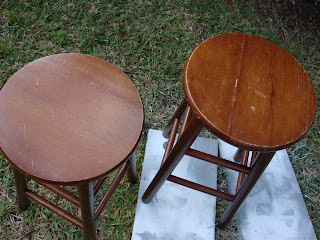 These stools were bought as temporary stools for our kitchen when we first did our kitchen. 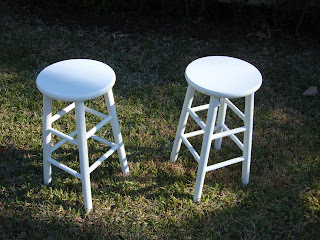 It took me a while to find the perfect white, modern stools back 5-6 years ago. Our kitchen island only has room for 2 stools and we keep these around for when guests come over to add around the island for casual pre meal conversation. They've come in very handy. However, they are in horrible shape and do not match my kitchen at all. So that's nothing a can of spray paint can't fix. I gave them a very light sanding, used primer, and white spray paint to finish it off. I have a question for all you spray paint experts out there, the top of the stools ended up looking uneven and rough, what am I doing wrong? 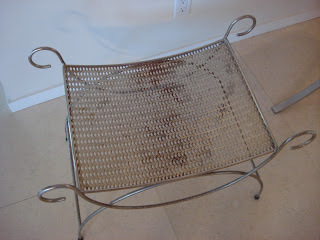 I love the new stool- I think a really fun color of spray paint would look fantastic and unexpected. Love what you did with the stools! To cute! What a difference a coat of paint will do! The suggestion above is what worked when I was fixing some frames I spray painted. I found that if you were not directly spraying the piece and it was falling on it, it was bumpy. Not an expert but this has happened to me too. I think it's the angle you have to hold the can. 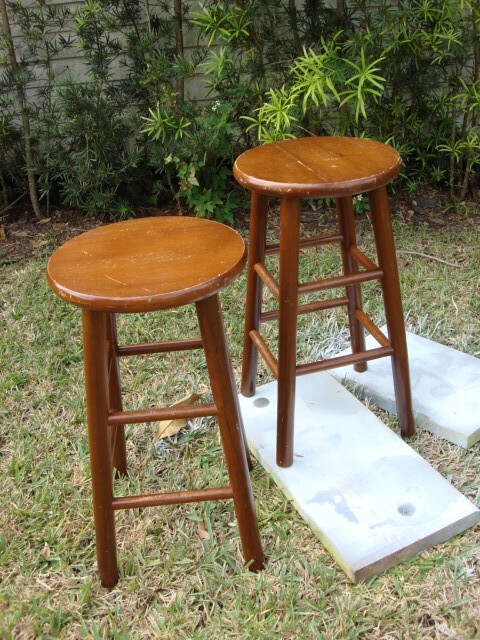 Try laying the stools on their sides (on sawhorses?) and spray the tops while holding the can upright. I learned this the hard way. Love the white!!! Love the transformation, the stools look so fresh and new now. The same thing happened when I spray painted my dining room chairs. I will try the suggestions listed above next time. Have a great week. Love that little stool! It could be either the angle you're spraying at or the temperature (if it's not warm enough). I've had both happen to me. I have no idea what to do about your uneven stool tops. They look gorgeous though! 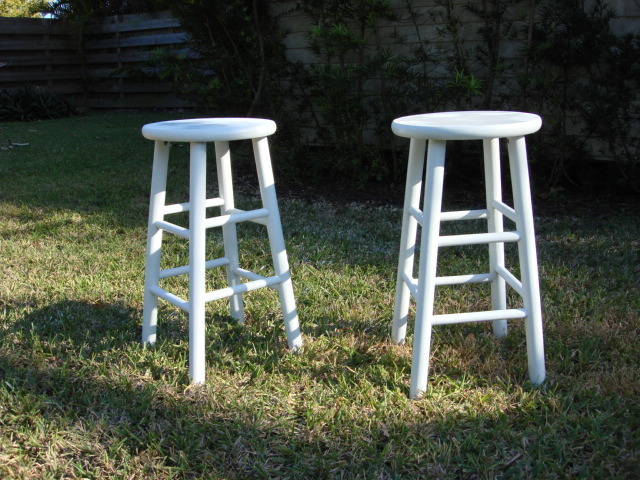 I love your stools and what a bargain !